Let's all go down to the favourite cafe that sells ice cream which you choose from different tubs. Suppose that there's Apricot, Banana and Citrus. YOU CANNOT CHOOSE A SELECTION OF ICE CREAM FLAVOURS THAT INCLUDES TOTALLY WHAT SOMEONE HAS ALREADY CHOSEN! This means that if someone has chosen Banana and Citrus I cannot then go and choose all three but I could choose to have Apricot on its own. 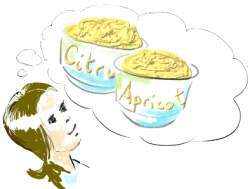 Sarah, the first child, chooses Apricot and Citrus. Tim, the second child chooses Banana and Citrus [this obeys the rule because Sarah's choice was not Banana on its own nor was it Citrus on its own]. Raj, the third child, chooses Citrus. Zoe, the fourth child, chooses Banana. Matt, has to be the last child because he can only choose Apricot and then there are no other choices left. In this example, with these children making these choices, only five children can have ice cream [using our rule]. But suppose more children wanted ice cream and so they got together to work out how this could be done. So seven children altogether. I think that the children can have different sized scoops so that even if they only have one flavour they have as much ice cream as someone choosing three flavours! Well that's what it's like when there are three flavours. At the most, seven children can go in that order and get those choices of ice cream. At worst, only three children can go and get ice cream. Mind you I think that there are other ways of getting seven. I wonder what would happen if ...? Please send in any results that you get along the way. I have to go - my mouth is watering for some ice cream! Generalising. Visualising. Multiplication & division. Interactivities. Investigations. Factors and multiples. Addition & subtraction. Working systematically. Practical Activity. Combinations.